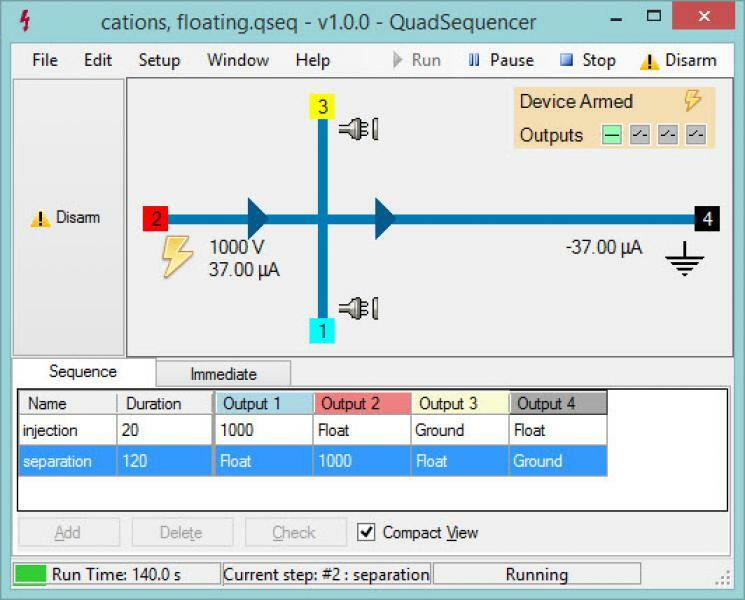 The QuadSequencer Software is used to control the ER430 High Voltage Sequencer. The software lets the user set up a sequence table of voltages to be applied. It also gives the user immediate control over the voltages applied at the four outputs of the ER430. It gives control of the ER430 digital outputs to control other equipment such as pumps and valves. During the experiment, processes happening inside the microfluidic chip can be followed by observing the chip layout graphic, which continually displays the applied voltages and recorded currents at each of the four outputs. The software includes a simulator that can be run without the ER430 hardware, to test an experiment beforehand or to use in teaching.